Warning: number_format() expects parameter 1 to be float, string given in number_field_formatter_view() (line 305 of /mnt/stor2-wc1-dfw1/404617/www.natts.com/web/content/modules/field/modules/number/number.module). Notice: Undefined index: text_processing in _text_sanitize() (line 321 of /mnt/stor2-wc1-dfw1/404617/www.natts.com/web/content/modules/field/modules/text/text.module). 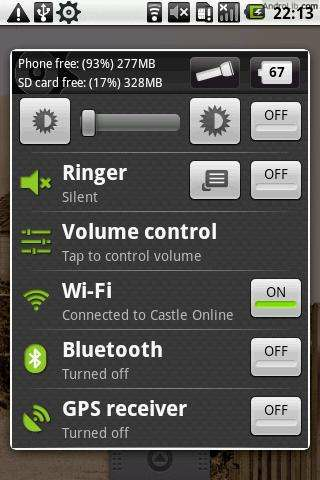 I've devoted virtually an entire screen on my mobile desktop to core and third party widgets that allow me to quickly adjust phone settings, such as turning on wifi or turning off GPS. With this app though, I needn't have bothered. Quick Settings presents itself as a permanent ('Ongoing') selection in your Android drop-down notifications, and you can set it up to appear as a pop-up on top of whatever else you might be doing. It looks great, can be customised (both visibility and ordering of the switches), has a small footprint and is free!